Business Birthdays are celebrations of achievement, hard-work, innovation, and a dedicated and supportive clientele. 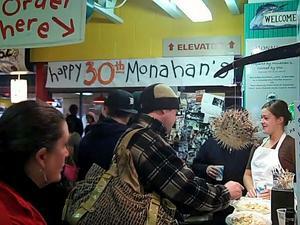 This Saturday, Monahan’s Seafood Market celebrated 30 years of serving Ann Arbor fresh, unique, and unusual fish. Birthday festivities there were - balloons, samples, special prices, eating happy people, contests with prizes, the smiling Monahan tribe helping behind and around the counter milling with people. I now know you can find balloons in the shape of a lobster. We sat and enjoyed lunch and watched the scene. 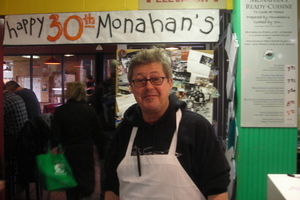 Monahan has offered catering for nearly 30 years and in 2004 expanded their expertise of ready-made items - chowders, pates, rubs, sauces, and grilling expertise - into a lunch counter. Their menu offers a wide variety including fried Narragansett squid (calamari), Prince Edward Island mussels steamed in white wine and garlic, and my personal favorite, hand shucked oysters (I love Menemsha oysters, which is listed as one of the featured fishes according to this past Friday’s Fish Report). You can also point to a cut of fish, recently filleted on the premises, and ask for it to be cooked for you. In addition to the diverse backgrounds and myriad culinary interests of his clientele, Monahan lauded the location of Ann Arbor itself as being part of his success. “We are right here in the middle of the country. We get all of the Great Lakes fish, all the New England stuff, Carolina Coast, Chesapeake Bay, Florida, all up and down the Pacific Coast, a lot of Alaskan fish, and we overnight in Hawaiian sashimi fish every week.â€ The crossroads of the fish channels and a customer base that is curious and discerning make fertile ground for Monahan’s Seafood Market to thrive. And thrive they have. Though named in 2004 by Saveur Magazine as one of the top markets in their 100 Special Issue, they are not resting on their laurels. 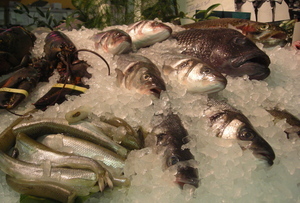 In the last three months, Monahan has started blogging about what is in season, recipes, and general fishy thoughts. In addition to the blog, Monahans posts specials on their Twitter account and Facebook page. 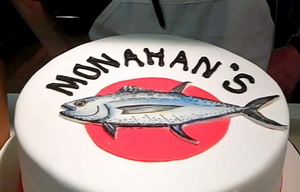 The care and dedication it takes to remove individual bones from a salmon steak is what we celebrated on Saturday for their 30th birthday; the devotion to meet their customers where they are is what Monahan’s shows with the new foray into social networking.